The interior of the Volvo XC90 endorses the car's premium feel, materials used and a high standard of detailing impart an air of luxury and craftsmanship. The driver will appreciate a clear and ergonomically designed instrument panels, which has a typically Scandinavian simplicity of line and functionality: plenty of information from a small number of meticulously designed instruments. The instruments and controls are angled slightly up towards the driver's eyes. Together with the high seating position, this enhances the feeling of control - the single quality that SUV buyers generally prize most highly. 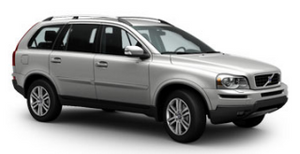 Despite being 25mm shorter than the Volvo V70 premium estate, the Volvo XC90 offers the greatest flexibility in the premium SUV class, with generous interior space housing seven individual, forward-facing seats - all with head restraints and seat belt pre-tensioners. The middle seat in the centre row has an integrated child booster cushion and also slides forwards independently so it can be positioned directly between the two front seats, thus improving contact between a child and the front seat occupants. What's more, the armrest between the front seats is removable to create more leg room for the passenger in this centre seat. In total, there are 64 different seating configurations. The third row features two separate seats, offering full comfort for children or for adults of modest build. Unlike some rivals, these do not take up valuable space or have to be clumsily removed, but instead they neatly and simply fold away individually out of sight into the boot floor when not in use, so are always on hand. Both the second and third rows of seats can be folded down to create an entirely flat luggage compartment floor no less than 3845mm long and 1127mm wide, with a volume of 1837 litres. In addition, the front passenger seat also folds forwards to accommodate extra-long loads. Even with all seven seats in use, there is still a useful amount of load space for the family - 249 litres, to be precise.